Over the weekend I took my son conker picking. He picked up several acorns along the way saying 'mummy I found a green conker' I explained that it was squirrel food and that conkers were big round and brown. 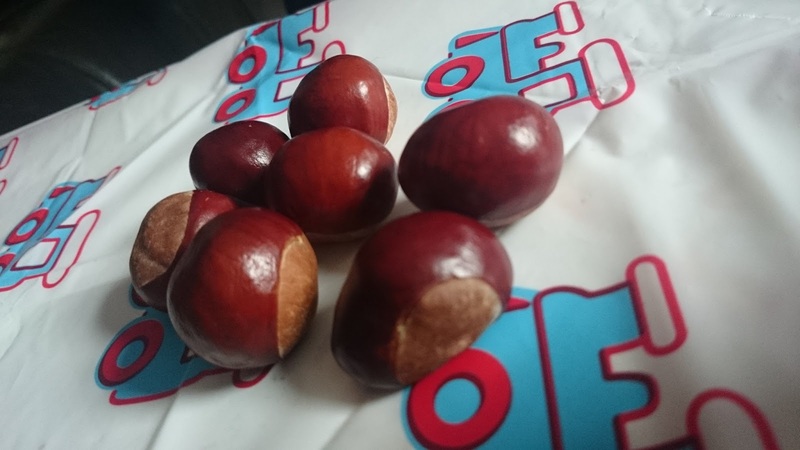 We took one of our 5p carrier bags with us and managed to gather 85 conkers!! Jared had asked daddy to count them when we got back. We were trying to think ways to use the shiny brown seeds when daddy suggested lets make them into decorations for Christmas. 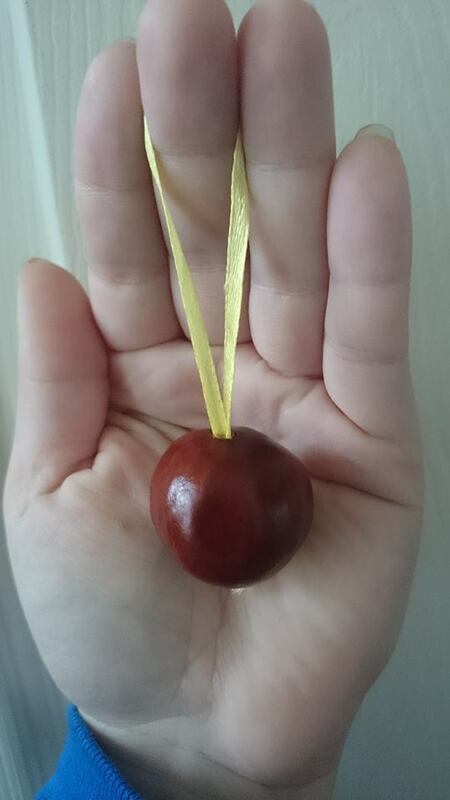 We let Jared pick a few conkers that he wanted to make into Christmas decorations. Then daddy used a thin screw driver to put a hole through, and I popped ribbon through the hole leaving a loop at the top and tying a knot at the bottom so they can hang on the tree in a couple of months. It took me a little while to sort the ribbon and get it right but this took no longer then twenty minuets, I was pretty impressed. 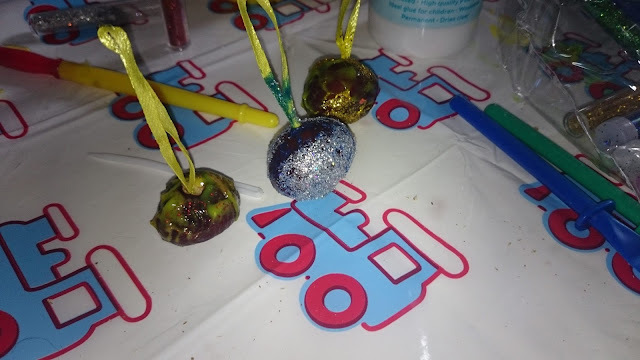 So the conkers were all ready to be painted and covered in glitter, I'm not sure who had the most fun out of three of us. I found it easier to hold the conker from the ribbon to paint them it also made it easier for Jared as one side would get painted then when he rolled it over the paint would rub off but we got there and ended up with some lovely home made decorations. There are many uses for surplus conkers from conker wars to keeping them in corners so the spiders stay away. We really enjoyed making these and will keep them for as long as we can, we made quite a few so family can have some for their tree's. I found this was a great way to get Jared interested in nature as we spent a good two hours walking around our local park then we spent another hour and a half as a family doing something that didn't involve gadgets and gizmo's. Rugby League and the Grand Final.